Hotcourses.com - "Meet the experts"
This interview was to help inspire people potentially interested in pursuing film and video editing courses via the portal site hotcourses.com. I put this together pretty quickly for the internal project wiki at work as a basic overview of what goes in and out of my remit as editor on a 52 x 11 min animated series, where within the process sequence reviews typically happen, and where things come from/ go to. It's not as entirely linear as this in practice (locks happen before all of the animation is done, for example - so that any extensions can be accommodated), a lot of things end up happening as simultaneously, and I'm typically working on anywhere between 5-26 episodes at a time... but this is the basic system. I'm sharing it here because I get asked a lot where the editing happens in animation ("surely the work's all done by the time you arrive on the scene?"). Answer: everywhere. I haven't even included the script changes and pickups/ ADR here. They basically get added throughout, ideally less frequently as time goes on - the further we are in an episode; the more people are affected if something needs to be changed. Q Pootle 5 was the animated television series I worked on over 2012-13. This 'making of' video was released on one of the series DVDs, and gives a basic overview of the process of creating an animated series: from concept art to foley and compositing. For additional information on the editing side of things running through animatic, animation, and delivery, I wrote a series of blog posts while working on this series, which are linked to from a roundup post which includes examples of how the edit may change throughout production. I recently had the opportunity to be on an awards jury, for the Royal Television Society's student awards. 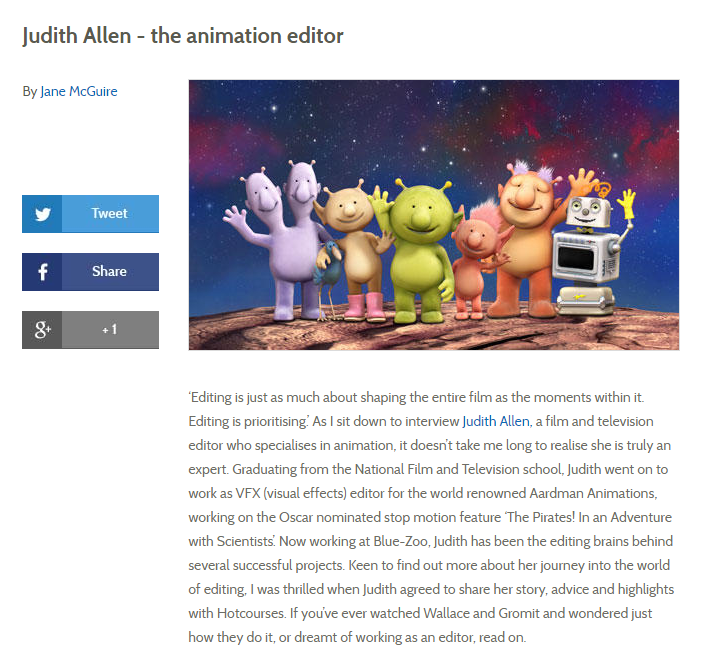 I had some experience of the awards themselves, having had films from my studies at the NFTS nominated the 2009 awards in the drama, animation, and entertainment categories of the postgraduate section. The film slate. It's one of the big symbols of film-making. But... there's a point to it. And that point is understood to a greater or lesser degree throughout the industry. But for an editor, it can be essential communication. We're usually not on set (we're editing the previous day's shots), and the less time we need to spend figuring information out, the more time we can spend being creative. Here are some notes based on some past difficulties I've encountered when syncing video and audio. A lot of it isn't necessarily intuitive if you haven't spent any time ingesting dailies, so I thought I'd get some general thoughts written down. They essentially form my wishlist of what I'd like to see when I get a new set of dailies. Other editors may disagree with some points or prefer other solutions, but this is what I am happiest with. Regional variations may apply; almost certainly in terminology. Over the weekend of 12-14 April, I once again took part in the 48 hour film challenge which is part of the annual Sci-Fi-London festival. It's known for helping directors get a first feature launched, including Gareth Edward's 2010 film Monsters (the sequel to which is now in post, and directed by my NFTS friend Tom Green, for whom I edited the short film Brixton 85 while at film school). Last night were the screenings of the top 20 films out of the 217 submitted at the end of the challenge. We knew going in that we were shortlisted to the top 10 - and therefore our film was being watched by the jury including Danny Boyle, Warwick Davis, Professor Brian Cox, and Neil Marshall. I'm very pleased to announce that we came 3rd; we're all very happy. Seeing the top 20 all in one go and discussing them afterwards really emphasised how difficult it must have been to judge such a wide range of topics, and how subjective enjoyment of a film really is. Written, shot and finished in two days. 3rd place at the Sci-Fi London 48hr Film Challenge 2014. Dialogue - He signed enlistment papers. He took an oath. Prop - Dice. We see a character roll two dice.